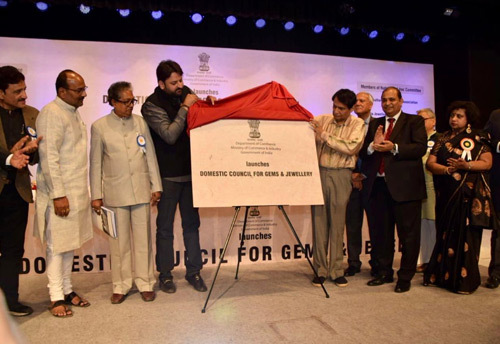 New Delhi, Jan 30 (KNN) Union Minister for Commerce & Industry and Civil Aviation Suresh Prabhu launched the Domestic Council for Gems & Jewellery, a new apex body for the sector. He also announced that the new council would plan to be fully operational with an elected body by May 1, 2019, which has a significance both as Labour Day and Maharashtra Day. Speaking about the significance of the launch, the minister said that the tremendous potential of the sector could be unlocked by introducing new ideas, new technologies and an organised structure to the sector and integrating these with the affinity for gold and gold jewellery that has been an important part of Indian culture for centuries. “The export industry which caters to the global market already has a turnover of US$ 42 billion, and the domestic market is estimated to be even bigger. Efforts to develop both these markets in an integrated manner will not only provide a massive boost to the economy, but will also create at least a few million additional jobs within the next few years,” he stated. While stressing that the Council is a representative body of every segment of the mammoth industry, Prabhu said that the Ministry of Commerce would extend complete support in facilitating its work. This would include an emphasis on skill development so as to take the highly talented artisan community into the era of modern technology. Alongside, the government would also stress the need to develop quality, purity and other standards that are on par with international norms, he added. In his concluding remarks, Prabhu said that the launch of the Domestic Council for gems & jewellery is a significant step and one amongst a series of several structured reforms undertaken by our government to make the industry more organised and unified.